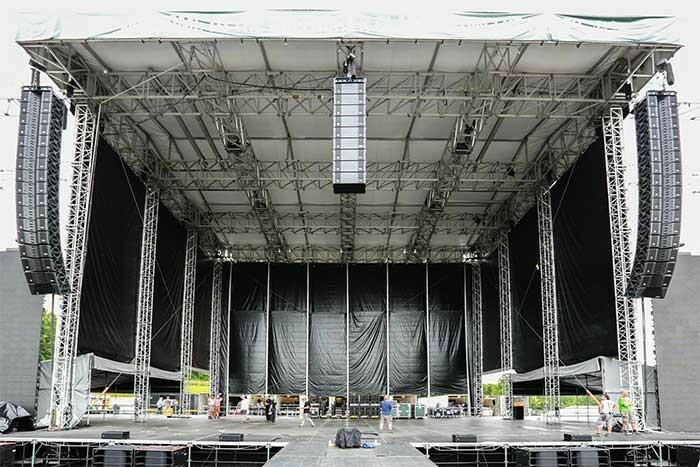 SES (Special Event Services) of Winston-Salem, NC and Nashville, TN recently provided a Large Format Outline GTO system for the Greenbrier Classic Concert Series. Produced by Gary Bowman of Nashville Live!, in conjunction with the Greenbrier and the PGA, the GCCS offers two days of first class entertainment on the State Fair Grounds in Fairlea, WV. This year’s headliners, Kenny Chesney (July 4) and Aerosmith (July 6) made the need for an A-Level PA system an absolute necessity. When tasked with designing a system to cover the nearly 1,000-foot long field, and crowds in excess of 25,000, SES Systems Engineer, and Director of Audio, Jason Farah, without question chose Outline to handle the job. "We chose the GTO system not only for its amazing power, but also the fidelity of the system at the distances it had to reach" - Jason states. Chris Rabold, FOH engineer for Kenny Chesney is quoted as saying: "I know Jim Brammer and SES well so when I saw they were the contractor for the event I contacted Jason Farah to start a dialogue. I admittedly only had a passing knowledge of Outline and knew even less about the GTO specifically. He gave me the lowdown and I went in with an open mind yet the obvious concerns one has when encountering a new rig. The stop in Greenbrier was one of the three I would do all year with Kenny Chesney where we didn't have our normal touring rig. To say I was surprised with what I heard would be an understatement and to say I was pleased wouldn't do the PA justice. I had headroom for days, used very little EQ, had no problem aligning zones and my mixed popped up just the way I wanted it to instantly. It’s a great sounding system and a real secret weapon in the US." Made up of 56 GTO, 4 GTO-DF, 6 GTO-LOW, 36 Butterfly Hi-Packs, 6 LIPF 082, and 32 LAB 21 HS Sub Bass Cabinets, this made for one of the largest GTO based systems ever deployed. 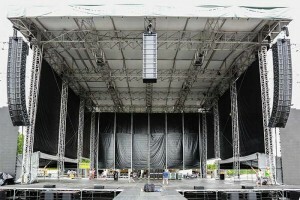 "When I ran the calculations in Outline’s OpenArray 3D prediction software, and after determining that the stage roof height would allow us to do so without impeding the lighting rigs of the artists, I chose to add a center hang of 6 GTO-LOW cabinets to help extend the low-end response of the system and eliminate some of the sub-bass cancellation zones that you would normally get with a system of this size, and the results were outstanding," Jason adds. "We really wanted to put the GTO system through a proper round of testing, and the Greenbrier show helped us effectively do that. With two very different styles of artists and engineers, we were able to listen to the GTO in a different way than we had before, and it performed spectacularly. Even standing at the very rear of the venue you still felt as much a part of the show as the front row, something that translated into a very positive fan experience as well as very pleased artist engineers" - states SES director of touring operations Michael Brammer. "The Outline system exceeded our expectations for this event, something that seems to be translating very well across the industry and allowing us more opportunities to provide systems of this calibre," said Jim Brammer, president of SES adds. In addition to the Greenbrier, SES has been able to supply GTO based systems for regular touring clients Darius Rucker, Justin Moore, and Joel Osteen Ministries, amongst others.